“GTA” is a Miami based production duo consisting of Matthew Van Toth (Van Toth) and Julio Mejia (JWLS). Their productions are classified as House music, influenced by other genres like Hip Hop, Salsa, and more. They have received acclaim by some of the heavy hitters on the Electronic scene today such as Afrojack, Diplo, and Laidback Luke. Van Toth and JWLS met through the social networking websites Soundcloud and Facebook. Van Toth’s individual sound was very Techy-House, while JWLS’ sound was strongly influenced by Hip Hop. When they blended their individual sounds, “GTA” was born. 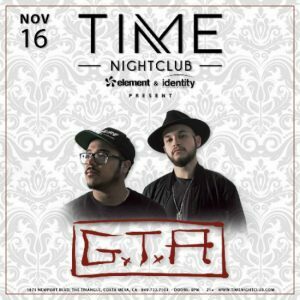 “It’s Time” is the first track they have collaborated, and through all of their efforts, they received the opportunity to release it through Afrojack’s label, Wall Recordings. “GTA” is currently in the studio working on new tracks to establish their place in the Electronic Music scene, and they are ready to show the world their own version of musical diversity.